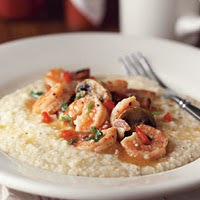 My Southern Sparkle: Shrimp & Grits, the food of the Gods! I have been wanting to make shrimp and grits all summer. Your recipe is much easier than the one I usually make. I'll have to try it. Please don't strip me of my southern citizenship. I don't love shrimp & grits. I like shrimp. And I like grits. But don't love them combined. There is one exception. A restaurant in my neighborhood makes a grits cake and serves it with shrimp and a very yummy sauce. They called it shrimp & grits but it's definately not what people think of when they think of that dish. Speaking of garlic, I've been putting away lots of it lately too. I don't love it fresh, but cook it and oh my! There is no better smell or taste!!! I have a feeling I really might like this with the garlic and shrimp and all. Like Nancy, even though I was raised in the South, I'm not a grits lover....Mr. Brown Socks IS and is a Midwesterner! Thanks for sharing. He would love this! Oh my goodness, this is one of my favorite recipes! I served it at Christmas brunch last year and it was a huge hit! Southern Living cookbooks are wonderful! Found you via Friday Follow!